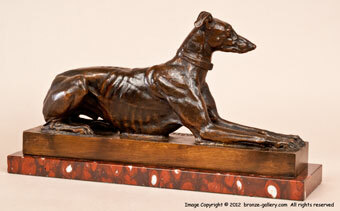 The Greyhound is one of the most ancient and regal of all dog breeds. They are graceful dogs, and their lean lines make them excellent subjects for art. These sight hounds are often depicted in sculpture over the years, and their form has changed very little over time. 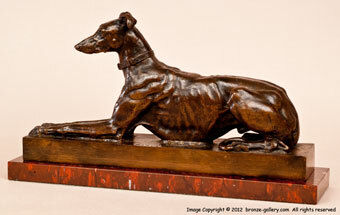 Barye's sculpture "Tom" is a superb example of a Greyhound at rest. This model is also interesting because it is a portrait of Barye's own dog named Tom, and it is the only known sculpture of one of Barye's own pets.. The Greyhound Tom is lying down almost sphinxlike, one can see all the muscle and bone structure, it is an incredibly powerful piece. The dog is quietly resting yet you can sense the alertness, he is ready to leap up and run at a moments notice. Barye first sculpted Tom in 1868 and not many of this fine model were cast. It is certainly one of his finest works. 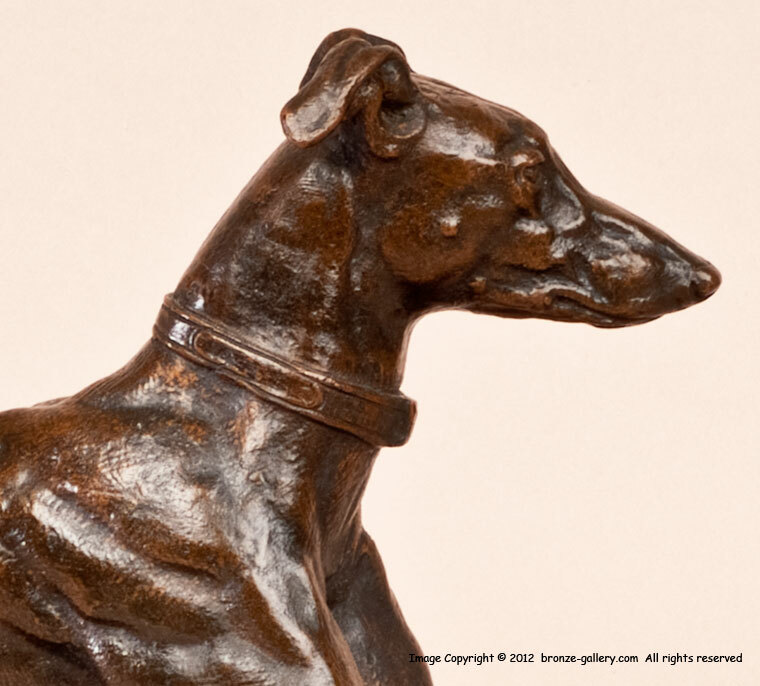 The bronze is finished with a rich brown patina for which many of Barye's best bronzes are known for. Tom is mounted on the original rouge marble base which compliments the bronze very nicely. This model is illustrated in Payne's book Animals in Bronze on page 205.